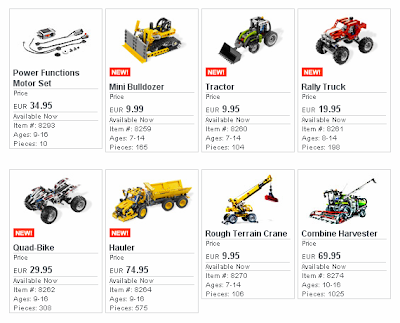 Most of the 1H2009 TECHNIC sets, are already available to order from S@H. For the moment, just the 8256 (Super Kart) is still missing. There, you may also already find the new PF parts released during 2008, to be ordered individually (PF Control Switch; PF Lights and the PF Extension Wire 20", released with Vestas Windmill set). I didn't know that either! Since the Vestas set has to use two wires in series to reach the top of the tower, I thought those were regular length. Anyway, I'd rather have only the shorter PF wire, if it meant having also a direct NXT-to-PF conversion wire. Strange, the new sets are showing up on the UK S@H, but not the individual parts. The long wires look interesting. Also, AVcampos, BlueToothKiwi of the NXTStep did apost over of making custom NXT-PF cables. Try searching for it. BTW let's not forget the black NXT brick. But I hope NXT 2.0 will not be in black, white is much cooler. 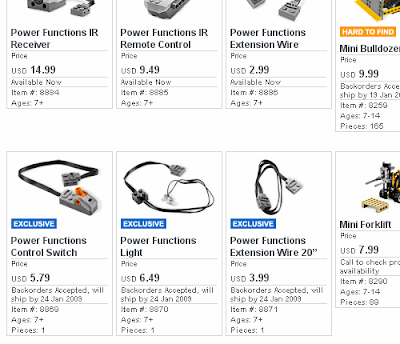 Yes, forgot to mention the new PF parts as well as the black NXT brick, are still only available in US. Usually they take a few days extra, to get into S@H for European countries. Lego Adam, sorry to burst your bubble, but the NXT 2.0 coming out this year is NOT a new set. Someone on the MCP team confirmed it as a new edition of the NXT-G software. Good news that the extension cables will probably come out in Europe. I'll probably get some, plus some small ones. I hope to make some PF-NXT cables.